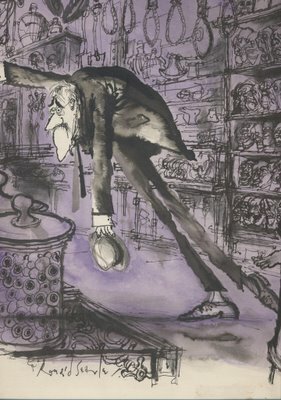 "If I drew as badly as Searle did when he started out as an illustrator, I would have given up and gone in search of honest work." Errr, you don’t mean his Japanese POW drawings? They’re actually very good reportage drawings in their own right, in my view, and show the progression of Searle the artist that you ask about. 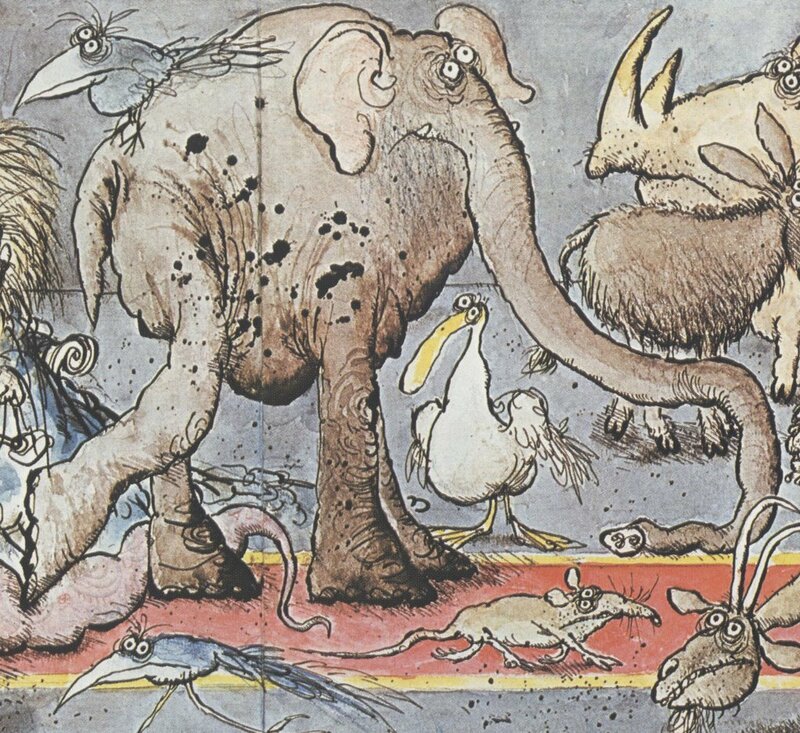 I believe Searle began his career as an illustrator before he was taken prisoner in World War II. 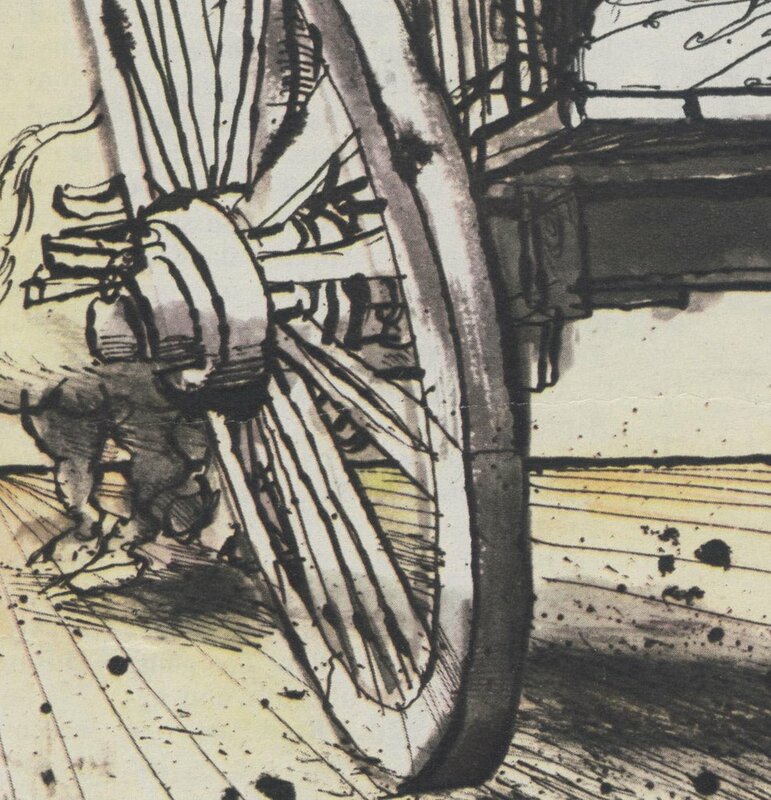 In my view, his Japanese POW drawings are impressive only because they were made under trying conditions with primitive materials and hidden under the beds of cholera patients until the POWs were liberated. It would be churlish to criticize the quality or composition or linework of art created under such dramatic circumstances. Such considerations are almost irrelevant. 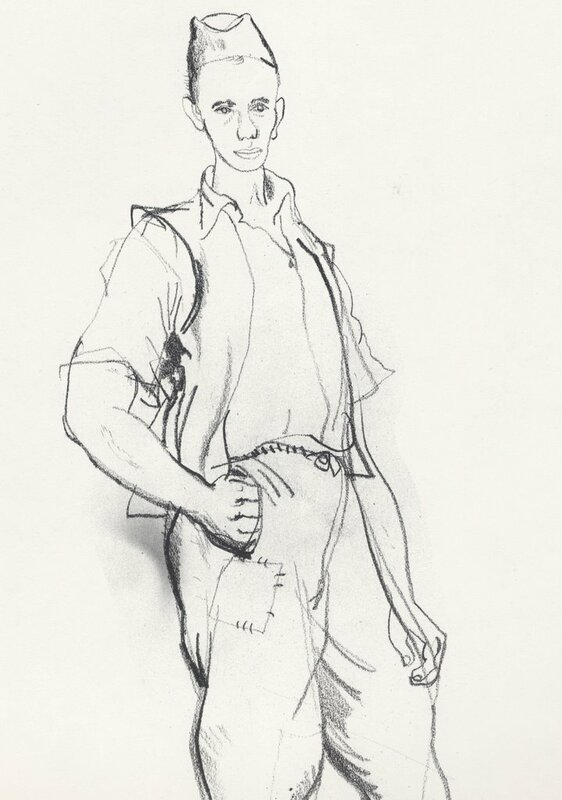 However, when I look at the Japanese POW drawings, I don't see the promise of the Searle that was to come. 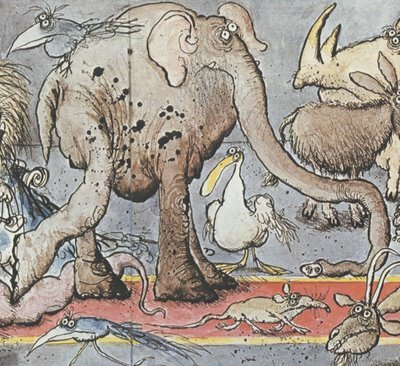 But the content, how Searle has shown the situation of those prisoners is of more interest than what ink or rag he was drawing on, surely? 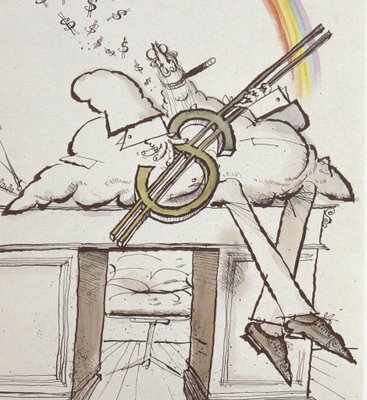 That said, i also prefer Searle’s illustration work. R Steadman is another favourite. Here's hoping for some of that natural progression through practice. Anonymous, to me the Japanese POW drawings often seem tentative and feeble, with repetitive lines where Searle struggled for a solution. I remember in particular one face of a Japanese officer that I would have guessed was drawn by an American adolescent raised on comic books, not a 25 year old professional illustrator. Having said that, I do agree 100% that there are many ways to achieve artistic excellence. 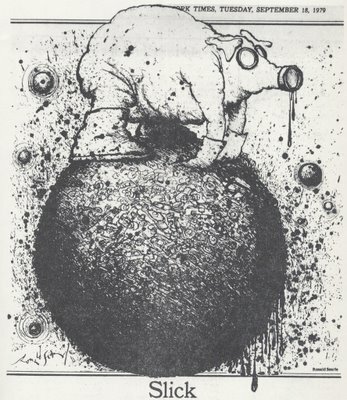 Art that responds to human torment-- art produced in prisons where convicts paint with their own blood, art produced in concentration camps by people who know they are about to die and that god has forsaken them, art by mental patients-- these art forms get special status in my book regardless of their technical skill. Funny that "anonymous" mentioned Ralph Steadman, because I've long thought that Searle's work must have had a big influence on him. Jack, I agree with you about Steadman. 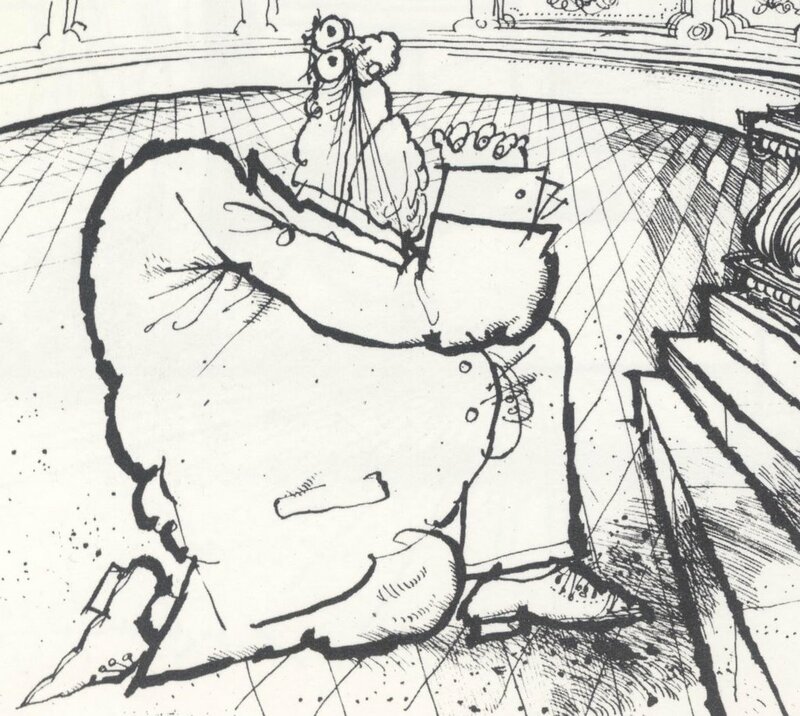 Same thing with Gerald Scarfe. Same thing with Jeff MacNelly. Same thing with 82% of political cartoonists of the last few decades. Searle's gravitational pull is really quite extraodinary. I just found this Blog. Thanks for sharing such fantastic work. Hmmm... my respect for your "eye" for art just fell a couple pegs. I'll have to agree, comments on the POW drawings seem a bit harsh. The drawings look great! Rudiger and Chud two-- sorry about that. I don't want to come across as unduly harsh on an artist I respect so deeply. 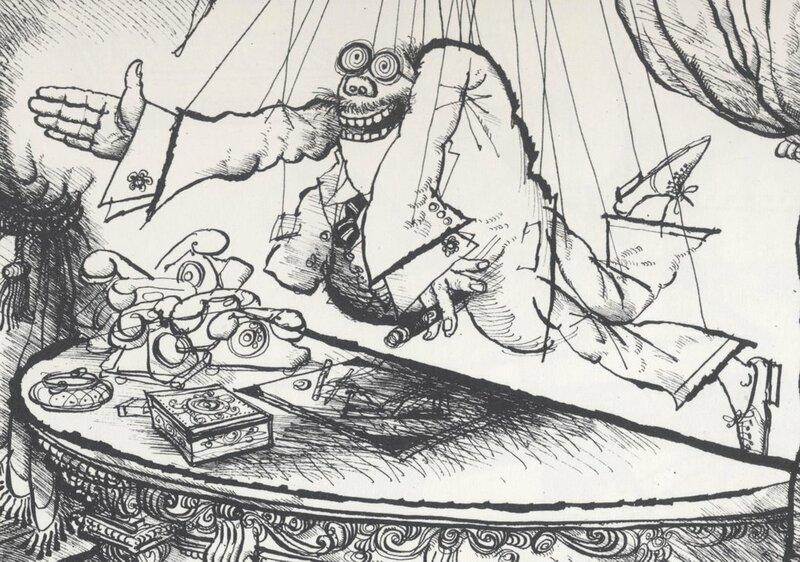 When I look at the art Searle was producing up to age 25, it just doesn't strike me as the kind of work that would cause one to pick illustration (as opposed to dry cleaning or carpentry) as a career. I went back to look at his POW drawings, and from my perspective, many of them don't hold up well against the drawings by soldiers in Yank. Of course, there are other artists who I think were decent early in their career, but then one season made a quantum leap forward. Don't know how or why that happens. I knew of Searle from an original St Trinians book my sister had from the early '60s (wish it was still around!) As a child, those abstracted visages of elongated and pointy black ink figures both entranced and scared me. I am just learning about Ronald Searle, as I have just recently learnt of his connection to my late grandfather Lofty Cannon - the subject of some of his illustrations. Although I do not have the information at hand right now, I recall reading that Searle drew with his non-preferred hand when he was a POW when he was very ill (drifting in and out of a coma) because his left hand (preferred hand) was covered in ulcers. I don't know if this helps to explain why perhaps you think the Japanese POW drawings are of a different standard to his previous work....? Perhaps you knew that already? 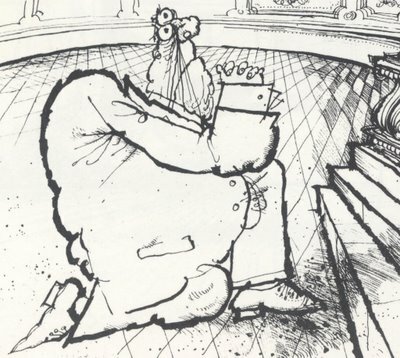 "His drawings have the potential to go horribly awry if Searle ends up an inch to the left or right of his goal." My impression is that going horribly awry is what his drawings are all about except he runs with it. It seems to me David that you are a very careful person, perhaps why you are attracted to these un-careful types. Could you be projecting your experience onto Searle? What is amazing to me is that people are so very different so that what comes with ease to one might be quite impossible for someone else. 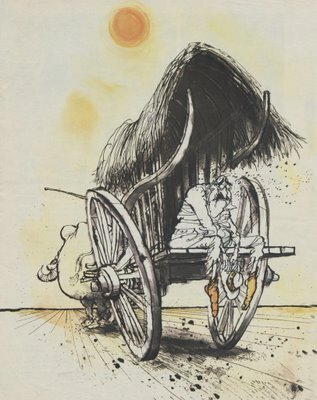 I have to admit that overall I find Searle/Steadman often too harsh for my taste. Here's the scary introduction i got as a little kid!